Starting out in a cell, a tremor allows you to start your escape. Find the correct route and avoid the Metrocops if you can (you can’t!). The maps end at the bottom of the large stairwell in a room with a door that has hall of mirrors effects. THIS MAP IS OLD. I’ve had this on my hard drive for nearly a year, it was one of my first maps. Its very old, and I can do far better now. But hey, download if you want, its set in some sort of jail complex-i-ma-bob. 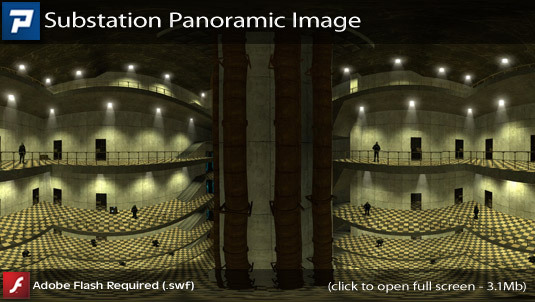 Copy substation1.bsp into your Half-Life 2 Maps folder. Open the console and type map substation1. This map seemed to work in Half-Life 2: Episode Two. As you can see I recommend you play this short map, not because the setting is original or amazing but because it’s actualy fun to play. The early rooms and area are a cross between bland and promising, but they are really just a prelude to the finale. Some sections have a very amatuerish feel about, high ledges and strange combinations of texures. But as the author noted, this is old and it’s easy to compare it with some recent EP2 releases where the attention to details is exceptional, but that’s not fair. If you open thgis map with the impression that it’s not the prettiest map you will see this month but a short fragfest then you won’t be disappointed. Buckle up for the finale! A quite entertaining 5/10 minutes play. If this is one of ” shadowmancer471’s” first maps from a year ago I’d like to see some of his recent stuff. The map has two doors that open to a hall of mirrors effect and I thought it was the end, but luckily it wasn’t. For the fact it’s an early map I’ll give it a PIN however if the author had released mods before I would have given it a PIL. The author has said “I can do far better now”, well I for one would like to see some of his recent work as he shows promise. I was tempted towards a PIN but it’s a bit brief. Quoting shadowmancer471 “THIS MAP IS OLD.Ive had this on my harddrive for nearly a year, it was one of my first maps. Its very old, and I can do far better now. But hey, download if you want, its set in some sort of jail complex-i-ma-bob”. I enjoyed this a lot. The combat in the last section was reasonably demanding. A must play but no need to drop what you are doing now. The Maybe I give this doesn’t mean to reflect negatively on the quality of work, it’s just short, ends abruptly, and really only has some map exploration and combat to its name, not much thought is really required to playing it. The big deep stairwell gave me no real problems except running out of pistol ammo as I sniped combine from above. The interesting thing was that, what I can only assume is another coincidence, the manhacks that the combine tossed out always seemed to come at me from behind just as I finished killing a combine, leaving me just barely enough time to dodge out of the way on numerous occasions. The only actual issue I had was that when I got trapped in the one room, I immediately started smacking the airvent with a crowbar, but it wouldn’t take damage and break until a few seconds AFTER the gas started. I had actually given up and tried to see if there was another way out of the gas and took far more damage than I really should have. I really don’t like it when mappers specifically create inconsistencies in the game rules in order to achieve an effect. If the mapper was specifically crafting the situation so that you couldn’t try to escape until after the gas started, then there should have been some sort of door covering the airvent so you couldn’t access it at all, then had that open to reveal the airvent as it let the gas in at the same time. As I stated initially, there’s no lack of quality, there’s just not enough length or variety for it to rank in with other play it now and play it later mods. Just a tip: When using movie maker and exporting to 16:9 make sure you have the correct setting under view (I think thats waht its called). Widescreen. Otherwise have it standard. It looks soo much better on youtube! I don’t think I have that option. I have a bunch of choices but when you select publish Movie>> YouTube there are no options. I’ll play around though. that all said, it’s a enjoyeble short map. to less real action for me, but that’s just personal. still enjoyeble, therefore I give it a Play it Later, Play it Now would be to much for this map, although Play it Later also not sounds right for it, when there was a recommendation Fun enough, or; Good enough I would have choosen that one, lol. this map didn’t had a real end to it. i played it twice because I thought I missed something. at the end there was nothing else to do and nowere to go to. it was that I opend the console the second time to get into no_clip mode, that I noticed the red error text of that hl2-sp-substation2 couldn’t be found otherwise I maybe still would be looking for the exit. the mapper should have added a game_text entitie that shows a text on screen like; Press Esc to get back to console, or just End. Well its to repetitive for me to really enjoy.Couple doors open and go nowhere,after that its just combine and manhacks to the bottom. I should add that I think you should play it but pay no attention to the 4 stars in the icon as its not worth that. Well this map answered one question for me, the reason my cell smells so bad is because there’s a rotting corpse in the ventilation duct. Anyhow, I like vertical combat in big stairwells so I enjoyed the last part of the map even with the annoying manhacks and no shotgun. The combat was evenly spaced and there was just enough dropped ammo and health to finish off the last combine. However, the ending, or lack of, left me just wandering around. This is worth playing if you want something to do for 10 minutes or so. You can’t just plow ahead (I died when I did that); and at first there didn’t seem to be much ammo or health, but that was resolved later on. I wanted a grenade at some point, though I don’t think one would have been very useful–maybe I just wanted something other than only the SMG or 9mm. The manhacks in the large room seemed to get confused (caught in the pipes or on the wrong floor). I guess that made it easier on me, since I could ignore them for a bit and it also kept them from coming at me as a horde. I don’t map, but I find this mod rather irritable in the number of enemies. I have this map before (Maybe outdated version).. but when at the last cell its need some map called substaion_2. Nice map anyway and good combine props. This is another map that was rendered nearly useless by the Steam Fiasco of 2010. If there’s anyone that has access to substation2 PLEASE send it to Phillip. Also, I think I figured out either an error on the Author’s part, or a hiccup on Steam’s part. That is, after you drop into the room from the ceiling and the Combine blows the door, but it never opens. If you noclip through it, just to the right there’s a door that opens to the first “hall of mirrors” effect. This door and the one previously mentioned are REVERSED. As to the second “hall of mirrors’, that can be cured by finding the substation2 map. If anyone can re-arrange the doors, this might help the playability…just a thought. Well, it’s very short, has a lot of locked doors, is mostly linear, only features three different enemies, has two doors that lead to HOMs and no proper ending. I honestly didn’t really enjoy this map. Its finale seems to be what people like most about it but I didn’t really enjoy that part either. It’s just a slaughterfest down a staircase. I feel like it would be more fun if the author put more weapons and supplies. NPC DM isn’t really my cup of tea but even if it was I would wish for more tools of destruction to take down the Metrocops with. I don’t recommend this map, I would say look elsewhere. Now I know I am being harsh here, in fact the first half was well done. But after that, it was becoming something that made me on the edge of not playing HL2 ever again. but let me analize the map a bit more. for a intro, it was OK, but sounds and maybe detail was lacking. I did not question the fact that no enemies were around, after all it felt like I was in the storage area of the prison. but when I opened a gate via a abandon monitor room, the map lost it reality and made it fell like just a game. I liked the gassing but giving me so much suit energy before that that again it felt like just a game. Next the combat. *sigh, the combat. the door that led to the combat did not blow off properly, so had to noclip. The first combat room had too many enemies for my liking. And then there were more hiding in side room, and when you proceed and avalanche of combine rushes you. No wonder I died on my first try. the Final fight was the tedious part. I suppose you can rush it, but with all the sight lines the enemies had, it felt impossible. So I took it very slowly, sniping with a pistol, wondering why the mapper had not gave me grenades or ranged weapons. I got so sick of it I just gave myself all the weapons in the game (with impulse 101) and the experience was far better. When I played it again with all the weapons, you only just finish it with the bare of your teeth. Summery: unless you like doing tedious sniping with pistols, DO NOT PLAY THIS MAP! By the time you finish it (and by the way there is no ending) you see the map as an example of poor combat with repetitive enemies, little health and with zero fun tactics that you can use.